The match would decide who would be the challenger for the World Champion Anatoly Karpov. Korchnoi had qualified from the Korchnoi - Spassky Candidates Final (1977), the Korchnoi - Petrosian Candidates Quarterfinal (1980), and the Korchnoi - Polugaevsky Candidates Semifinal (1980). Hübner qualified from Lucerne (1979), the Rio de Janeiro Interzonal (1979), the Hübner - Adorjan Candidates Quarterfinal (1980), and the Hübner - Portisch Candidates Semifinal (1980). The winner would be the best of 16 games (1) or the first to get 8,5 points. The 49-year-old Korchnoi had not played in any tournament since the semifinal in August, whereas the 32-year-old Hübner had played in Tilburg Interpolis (1980) in September. Korchnoi advanced to the Karpov - Korchnoi World Championship Rematch (1981). Further reading: Hübner Kortschnoi Finale in Meran. Warum gab Hübner auf? by Ludek Pachman (Rau, Düsseldorf 1981. 125 p.). Hübner did not want to play during Christmas and had asked the FIDE president Fridrik Olafsson for postponement of the match till January. (17) When this was rejected, Hilgert requested play on holidays, so that Korchnoi could not rest in Switzerland while Hübner had to stay in the hotel. (17) See also Antonio Gude in El ajedrez 14 (February 1981), pp. 61-66 (http://www.historiadelajedrezespano...). (1) Tidskrift för Schack, vol. 87 (1981), p. 2. (2) The Times, 11 October 1980, p. 10. (3) Tidskrift för Schack, vol. 86 (1980), p. 210. (4) El País (Madrid), 26 December 1980 (http://elpais.com/diario/1980/12/26...). (5) Wolfram Runkel in Die Zeit, 16 January 1981 (http://www.zeit.de/1981/04/die-heim...). (6) Wikipedia article: Wilfried Hilgert. (7) Der Spiegel, 3/1981, p. 88 (http://www.spiegel.de/spiegel/print...). (8) Het Vrije Volk, 10 January 1981, p. 12. (10) Het Vrije Volk, 8 January 1981, p. 17. (11) Het Vrije Volk, 9 January 1981, p. 9. (12) Mobile Register, 7 December 1980, p. 113. (13) Leeuwarder Courant, 5 January 1981, p. 22. (14) Het Vrije Volk, 9 January 1981, p. 9. (15) Alexander Jongsma in De Telegraaf, 10 January 1981, p. 37. (16) Het Vrije Volk, 10 January 1981, p. 12. (17) Der Spiegel, 52/1980, pp. 159-160, 164 (http://www.spiegel.de/spiegel/print...). (18) Der Spiegel, 4/1981 pp. 86-87 (http://www.spiegel.de/spiegel/print...). (19) Der Spiegel, 53/1980, pp. 75-76 (http://www.spiegel.de/spiegel/print...). (20) Der Spiegel, 5/1981, pp. 152-158 (http://www.spiegel.de/spiegel/print...). Original collections: Game Collection: WCC Index (Korchnoi-Huebner 1980) by User: nescio2 and Game Collection: Korchnoi - Hübner Candidates Final 1980/81 by User: Tabanus. Game dates are from the Dutch newspapers at http://kranten.delpher.nl/. Thanks to User: zanzibar for trying to improve the English. I used to think current media was trending toward being more trashy and sensationalistic then that of generations past. . . . . . Now Im not so sure. Apr-02-17 Howard: Which "book" is Keene referring to ? Apr-03-17 Retireborn: Probably Massacre in Merano? I no longer own it, but ISTR it had a preliminary section about the candidate matches. Is <sensitive> meant as a euphemism? Apr-03-17 Petrosianic: I haven't heard any rumors or gossip other than the obvious. That Huebner lost a critical game, and his nerve broke, just as it did against Petrosian in 1971. Sally Simpson: ...and in 1983 Hübner was evicted from the World Championship cycle by a spin of the roulette wheel. Red for Smyslov, Black for Hübner. If you had written a fictional piece about this way to decide a World Championship Quarter Final and said on the first spin it came up green (0) It would have been binned for being to far fetched. But that is what happened! A picture of the deciding who wins spin. Look how many people are attending (Hübner is missing, he had gone home in disgust.). The tension waiting for the ball to finally drop into a slot must have quite unbearable. Apr-05-17 Granny O Doul: If he didn't care enough about the wheel spin to go watch, he deserved to lose it. HeMateMe: pure FIDE, using a roulette wheel to determine the winner of a Candidates match. They couldn't run a lemonade stand without screwing it up. Apr-06-17 Howard: Well, the roulette wheel method might have been mutually agreed upon by the two players before the match, so let's not be so quick to "blame" FIDE for it. FIDE had nothing to do with it, in this case. 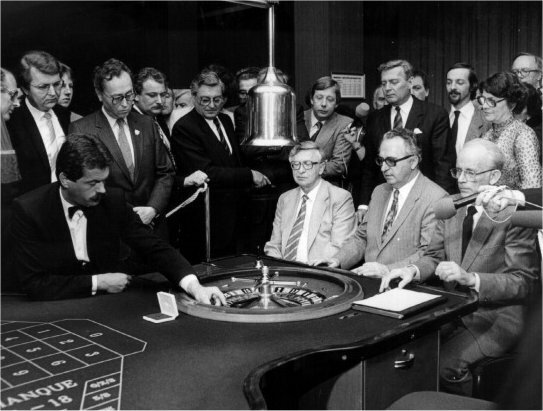 The casino was also the sponsor of the match and using the roulette to break the tie was the director's idea (which both players agreed to, anyway). HeMateMe: maybe something better should have been proposed by FIDE? Both guys were weak blitz players? I doubt that.